In addition to minting precious metals, SilverTowne also offers professional assay services. Anyone can send gold and silver to the SilverTowne Indiana facility to find the percentage of pure gold and silver present in the products. However, SilverTowne is most famous for its bullion bars and bullion rounds. Have a look for yourself in the following product preview video. The attention to detail is incredible, as even simple designs are depicted with a quiet elegance that surpasses products from other comparable mints. In fact, some of its popular silver rounds successfully replicate the timeless designs on American coinage like the Indian Head Nickel. Interestingly, all of SilverTowne’s precious metals products are struck using 0.999 pure silver. It is considered one of the best sources of precious metals products in the country. The alluring designs, combined with pure silver at relatively lower premiums, make their products ideal vehicles of silver bullion for investors. Its husband and wife co-founders – Leon and Ruhama Hendrickson, established the SilverTowne Mint in 1973. Ever since, its products have grown in popularity as SilverTowne produces quality precious metals products year after year. Although the minting facility was founded only in 1973, the Hendricksons set upon this path back in 1949. SilverTowne started as a small family-run business that dealt in numismatics and precious metals. However, its proprietors identified the growing popularity of bullion products, as both investment assets as well as collectible items. SilverTowne Mint commenced operations and started minting products on Bliss Press and Nickel Presses in 1973. Over a decade of operations saw unprecedented growth. In fact, the growth was so rapid that the old facility was turning out to be a hindrance to supplying the demand for SilverTowne bullion products. Hence, the facility was relocated to a much larger space in Winchester, Indiana, in 1985 – where it stands even today. It started offering custom minting services to individuals, companies, and governments for bullion products such as rounds, bars, and medals. Even now, their custom imprints are regarded as the best option for businesses in North America that want to run unique promotions like commissioning coins or mementos with the company logo, etc. The success of SilverTowne Mint represents the fulfilment of the American dream. A dream that many Americans, like the Hendricksons, chase after. This is the retail arm of SilverTowne. It was the first company founded by SilverTowne’s masterminds – Leon and Ruhama Hendrickson. From a tiny coin shop, it has blossomed into two retail departments housed in the same building. In addition to the brick-and-mortar showroom in Winchester, Indiana, SilverTowne has a vast selection of bullion products that can be purchased through its website and catalog. The minting arm of SilverTowne erected in 1973. It now is an integral part of the SilverTowne family. 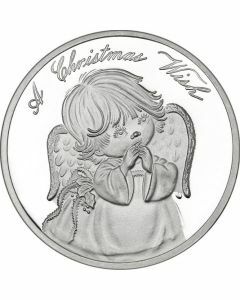 SilverTowne Mint is the place to get custom minting of gold & silver coins, “challenge coins,” and custom minting of medallions for club, corporate or promotional use. In fact, professionally-hand painted enameled pieces can also be ordered and purchased. SilverTowne Farms breeds the finest Simmental cattle for both commercial and purebred cattlemen. Although this particular part of the SilverTowne business isn’t directly connected to their precious metals arm, it forms an integral part of the SilverTowne family business. Many SilverTowne Mint products include replicas and re-imaginations of older coins and/or important American symbols. Hence, they provide an alternate and more economical avenue for investment in silver with these patriotic designs, as rounds and bars usually command lower premiums over the spot price of silver. Featuring elegant imagery from the Indian Head Nickel, these 1 oz and 5 oz Silver Rounds from SilverTowne celebrate the work of a great engraver of his time – James Earle Fraser. They are struck using 0.999 silver. Hence, they make excellent investment assets as well as collectibles. The first silver round in this series was released in 2016. These age-old designs set the stage for reminiscing about the times gone by. American Silver Eagles are most famous and purchased modern silver coins in the world. SilverTowne makes a similar but larger replication of this coin, striking a silver round using 5 troy ounces of .999 fine silver. The obverses display Lady Liberty’s familiar walk across the landscape, as the sun sets in the background. SilverTowne has done Weinman’s design justice with these replicas. Although they do not carry any legal tender value, these American Eagle Replicas will make wonderful additions to silver collections and investment portfolios. Showcasing a brilliant rendition of one of the most iconic symbols of American independence, these Liberty Bell Silver Rounds are a huge hit among investors and collectors. The large and famous crack across the bell is displayed in marvelous detail – an incredible reminder of the crack left by the ringing of the bell for the very first time. Every one of these rounds features a stackable design. Hence, storing multiple rounds is easier, making these coins more portable and easy to handle. Again featuring a stackable design for easy storage, these 1 oz and 5 oz Silver Rounds highlight the famous prospector design on their obverse and reverse sides. The SilverTowne Prospector and his faithful donkey have become an iconic duo. Portraying a man equipped with a pickaxe – prepared for a long day of mining. It is a gentle reminder of simpler times, times when people would grab their pickaxes and head off in search of gold and silver. The famous SilverTowne Prospector and his donkey appear on the obverses of these mint silver bars as well. 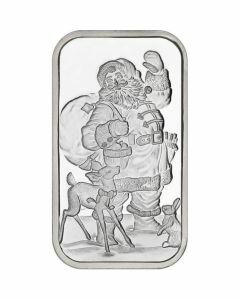 While the prospector image occupies the top portion of this side, the weight and purity of the silver in the bar is imprinted below. These bars are struck using 0.999 pure silver, in weights of 1 oz and 5 oz. These silver bars are unique, and stand out in comparison to the other silver bars struck by SilverTowne Mint. Every one of these silver bars is of the cast variety, i.e. molten silver is poured into molds to give the bars their shape. Hence, they feature rough finishes, and uneven edges. However, this imparts a certain rustic quality to these bars that mint bars cannot hope to replicate. Since Silvertowne Mint bullion produts usually feature much lower price premiums over the live spot price of silver – they consistently remain very popular amongst investors who want to accumulate hefty amounts of 0.999 pure gold and silver bullion for the long term.